Click to enlarge any photo into separate window - more damage pictures at bottom of page. There are some situations that fill a storm chaser with anticipation about the coming day. Early morning storms clearing to humid sunshine is one of these. This was the case on the 18th November. 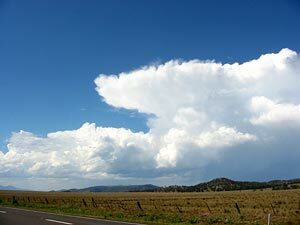 Around 10am in the sunshine behind the storms the first cumulus began forming over the Blue Mountains west of Sydney. By 11am the first weak storms had formed. I had targeted the Hunter region of NSW, but did not want to get too far ahead of any early development in Sydney. So I hung in the Richmond - Windsor area. 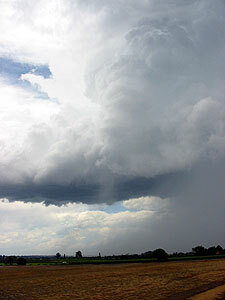 I was rewarded with several rapidly developing storms. The best structure was seen in one just north of Windsor. To the south I received a quick glimpse through the trees of a lowering from a storm SE of Windsor. I knew that there was potential today. It was at this stage that I made my crucial mistake for the day. I was faced with the decision of heading north up the Putty Road or east through Sydney's northern suburbs to get the the Pacific Hwy and the coast. I choose the Putty Road. The Putty Road reminds one just how vast and unpopulated Australia is. 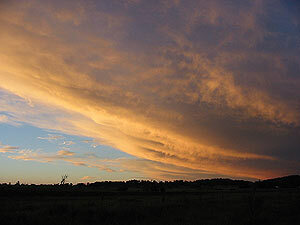 Although it starts on Sydney's outskirts it is 160km of remote countryside, largely national park and hilly sandstone. Along its whole length there are perhaps 2-3 places where the trees and hills open enough for a photo. In short it is not a storm chasing road. 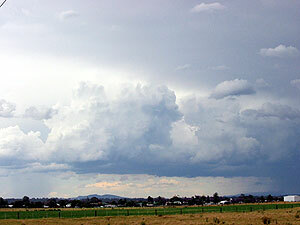 But it does severe a purpose and that is getting you from the Sydney Basin, to the upper Hunter River Valley in the shortest amount of time. It was with this in mind I committed. 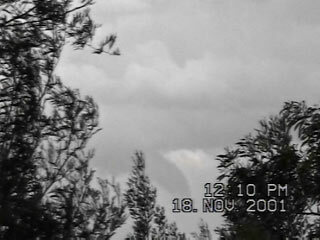 I thought that I would beat any storm development into the Hunter Valley. What a joke, I was not even 30 mins into the trip before I was overtaken by a large storm. A few close Cg's taunted me, as did the odd glimpse of magnificent storm structure. In the end however I emerged 2 hours later at Singleton to find I was under backsheared anvil from a large storm well to the east and uncatchable. I continued north up the Hunter Valley. 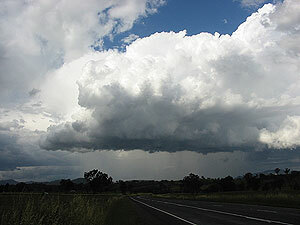 At the town of Scone I saw a group of people looking skywards - storm chasers ! It was Jimmy, Mario, Geoff and Matt. They had chased west from Sydney to the Mudgee / Gulgong area. After a few greetings and an exchange of chase tallies for the day I departed once again northwards. I wanted to catch the promising line of storms that stretched NW/SE ahead of me. I was fated not to catch any major storms today, I kept passing under the rear flanks of storms further east and north east. Up onto the Northern Tablelands and the road swings more NE, I was at last gaining on the storm line, but I was also running short of daylight. 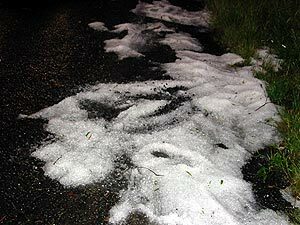 At Ben Lomond I noticed hail drifts on the side of the road and some trees down. I guessed that I was less than 1 hour behind the activity. 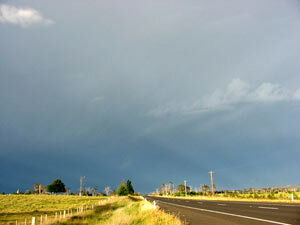 I never did catch the storms and at 8pm found a motel in Glen Innes. I place that storm chasers seem to find themselves over and over again. However the show was not over. At 2am in the morning the trough line passed overhead. It brought with it a spectacular lightning show. It seemed to be mostly CC lightning, but with cloud bases only 500ft above you it does not leave much viewing room. The thunder was continuous for almost an hour. Small hail even fell. In hindsight it is easy to say that I should have chased the coast. 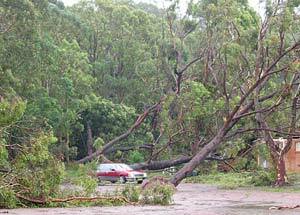 But than again I would have passed the Port Stephens area 2 hours before the supercell that caused havoc. 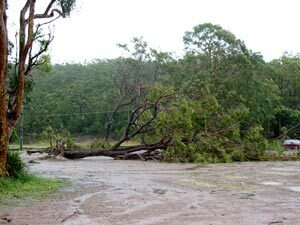 There was actually many more instances of tree damage along the Northern Tablelands, every 30 mins or so there were areas that had damage, but luckily none occurred in towns. 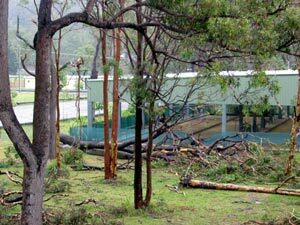 Some of the tree damage at Port Stephens. 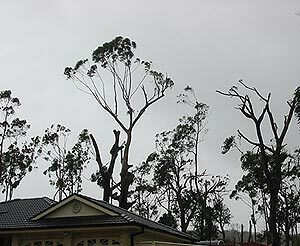 The last picture above shows how some trees were denuded of most branches. These photos were taken 48 hours later, I did not encounter this possible supercell storm. I could have taken photos of homes damaged, but I believe this is not in the spirit of storm chasing. We all enjoy severe storms and marvel at their power, but we prefer to see the destruction confined to paddocks, not towns and cities. 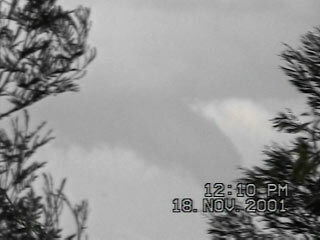 A close up of the suspicious cloud near Windsor.